The seasons are getting ready to change and as they change, we ope the windows more often, and we live inside more than out because the temperatures make it more formidable to be inside. As you spend more time inside, it is only natural that more dust happens, and as the windows are open, pollen and mold spores still pass through the screened windows. With 3 kids that are treated for allergies year round I am always looking for a way to help capture airborne particles like dust, pollen, pet dander and Honeywell HPA060 Series Air Purifier can really help your battle against the airborne particles. Honeywell is the #1 recommended air purifier brand of Allergists and some of the Honeywell air purifiers feature odor reducing pre-filters which also help with household odors. Set up is easy and the air purifier begins working immediately to clean up that room. Plug in the purifier, choose the desired leaning level by simply turning the knob to Germ, General Cleaning or Allergen setting. Germs are to help with airborne germs, while the General is best for everyday, and odors. Filters will need replaced periodically depending on how frequently you run your Honeywell HPA060 Series Air Purifier will create the frequency for filter changing. An electronic filter replacement reminder & The dial control is super easy to use and provides 3 air cleaning levels: General Clean, Germs & Allergens. This product is ENERGY STAR® qualified and it is perfect for smaller rooms (75 sq. ft.). The price is super frugal $89.99 and it offers a 5-year warranty. 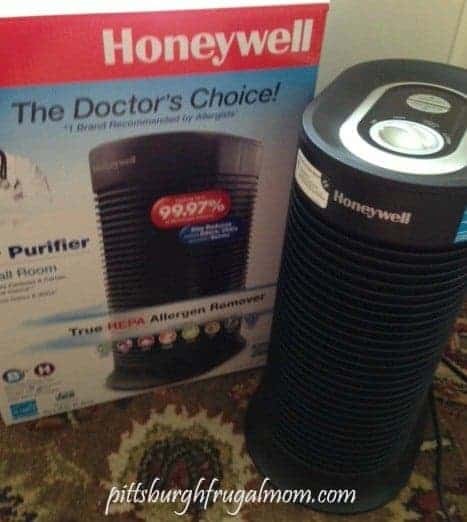 The frugality of the Honeywell Air Purifier may be less trips to the pharmacy for medical aids to help with allergies. You might even find that less particles passing through the air could create less germs passing and less sickness. I find that these help keep the dust down and that is a blessing! Get ready for flu and allergy season ahead of it by learning more about this great air purifier at the Honeywell website. 2 tissues up for this great air purifier from Honeywell.